Joseph shared and defended his friend's Galileo's heliocentric view of the cosmos. Joseph himself was removed from his post as superior general. Eighty years after his death his name was cleared. 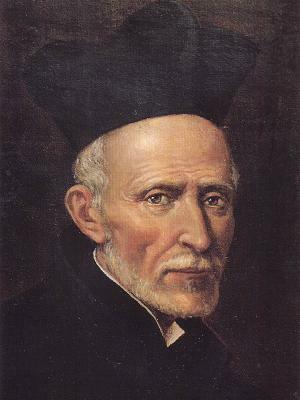 Summary: St Joseph Calasanz (Calasanctius), Priest, Religious. Born in Aragon (Spain) in 1557; died at Rome on this day in 1648. A lawyer, theologian, and presbyter who gave away much of his family fortune and devoted himself to providing free education for poor children in Rome. Founded the Clerks Regular of the Christian Schools (Piarists) and suffered many trials in later life at the hands of jealous colleagues and Church authorities. Noted especially for his patience in the midst of suffering. 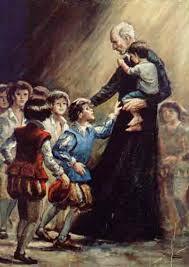 Joseph of Calasanz was a Spanish priest who went to Rome at the end of the sixteenth century and started schools for homeless children. He also started a congregation to service these schools which is today spread over the whole world. Patrick Duffy tells his story. Joseph of Calasanz, was from Aragon, Spain. He was well educated in philosophy, law and theology. His father wanted him to marry and continue the family, but on recovery from an illness which brought him close to death, he decided to become a priest. For ten years after he was ordained he held various posts as a secretary, administrator and theologian in the diocese of Albarracín in Spain. In 1592 Joseph went to Rome, where he became a theologian in the service of Cardinal Marcoantonio Colonna and a tutor to his nephew. He worked alongside St. Camillus de Lellis during the plague that hit Rome at the time and helped carry the bodies of the dead on his own shoulders to burial. Joseph worked with the Confraternity of Christian Doctrine and soon he opened a school for homeless children himself. Within ten years he had rented a house at Sant’Andrea della Valle and started a community for teaching poor children, which later were called the Piarists. Popes Clement VIII (Aldobrandini 1592-1605) and Paul V (Borghese 1605-21) both gave him financial help and soon he had a thousand children in his charge. In 1612, the school moved to San Pantaleo, near Piazza Navona, and this became the motherhouse of what came to be called the Pious Schools. In September 1616 the first public and free school in Frascati was started up on his initiative. A year later, Pope Paul V approved the “Congregation of the Pious Schools,” the first religious institute dedicated to teaching. During the following years Joseph was able to set up Pious Schools in various parts of Europe. Joseph was a man of great moral courage. He accepted Jewish children into his schools and made sure they were treated equally. Although Latin was the accepted language of the time, he defended and had textbooks in vernacular languages. He advanced the study of mathematics and science. He was a friend of the scientist Galileo Galilei, and sent some of his Piarists to study with him. He shared and defended Galileo’s heliocentric view of the cosmos and even after Galileo was condemned and became blind, he stood by him. This caused opposition towards him and his congregation in influential quarters and he was removed from his post as superior general of the Piarists, but he remained patient and humble in the face of these trials. Joseph died in 1648, at the age of 90 and was buried in the church of San Pantaleo. Eight years after his death, Pope Alexander VII (Fabio Chigi 1655-67) cleared his name and that of the Pious Schools so the Piarist congregation continued to spread throughout Europe. It had considerable success in education of physically and mentally disabled persons. 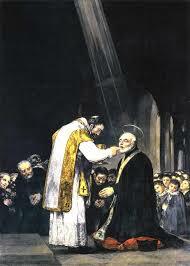 ‘The last Communion of St Joseph Calasanz’ as painted by the spanish painter Goya. A beautiful painting of him by Francisco de Goya entitled The Last Communion of Saint Jose de Calasanz (1819) hangs in the Church of the Escuelas Pias de San Antón, Madrid, Spain. Joseph of Calasanz was beatified in 1748 by Pope Benedict XIV and canonised by Pope Clement XIII in 1767. In 1948, Pope Pius XII declared Joseph the patron of Christian popular schools. Today the congregation has 1421 members in 32 countries on four continents (Europe, Asia, Africa and America).